When courts issue new decisions about how law enforcement can obtain records and data from companies, it's not just the police who have to follow the new rules. The companies that turn over the data have a big role to play in ensuring that the law is followed. A new court decision requiring police to use a search warrant in order to obtain cell tracking records underscores the importance phone companies can play in extending important privacy protections throughout the country. In United States v. Davis, the Eleventh Circuit Court of Appeals ruled last week that because people have a Fourth Amendment expectation of privacy in their location, police need to use a search warrant to obtain cell site location information. Davis is the first case in which a federal appeals court found an expectation of privacy in cell site records, reaching the opposite conclusion of a Fifth Circuit Court of Appeals opinion from last year. Instead, the Eleventh Circuit noted "even one point of cell site location data can be within a reasonable expectation of privacy" because people carry cell phones almost anywhere they go, joining the state high courts of Massachusetts and New Jersey in requiring police convince a judge there is probable cause to believe the records will show or lead to evidence of a crime. This means that any time state or federal law enforcement within the Eleventh Circuit (Alabama, Florida and Georgia) wants to gather location information from a person's cell phone, whether by seeking historical or real-time cell site records, requesting a tower dump or using a "stingray," police need to get a search warrant. Even though the decision only applies to federal and state law enforcement in those three southern states, cell phone companies now have a chance to extend Davis beyond the confines of the Eleventh Circuit. When it comes to implementing landmark decisions concerning constitutional rights in the digital age, companies have been in this position before. In 2010, the Sixth Circuit Court of Appeals—which only binds law enforcement in Kentucky, Michigan, Ohio and Tennessee—ruled in United States v. Warshak that people have an expectation of privacy in the contents of all emails stored with an online service provider, regardless of their age. As a result, law enforcement in those states have to use a search warrant to obtain the contents of emails. Although Warshak only controlled in the Sixth Circuit, many of the largest online communication service providers including Facebook, Google, Apple, Microsoft and Yahoo made Warshak the rule across the board, and began demanding all law enforcement across the country use a warrant to obtain the contents of electronic communications. As that became the internal policy for the companies, eventually even the Department of Justice followed, ordering federal prosecutors and law enforcement agents nationwide to use a warrant to obtain emails. A uniform approach makes sense. The Fourth Amendment is the law throughout the country, binding both federal and state law enforcement. While states are free to interpret their state constitutions or enact laws that impose stronger legal protections than those in the Fourth Amendment, they cannot provide weaker privacy protections. So, once a federal appeals court issues a ruling that requires state and federal law enforcement in one part of the country to use a warrant, it would be inconsistent to permit officers in other parts of the country to use weaker legal process to get those same records. The Fourth Amendment must mean the same thing everywhere and not vary from state to state; inconsistencies reduce legal protections for some people and tempts officers from a more restrictive jurisdiction to see if their counterparts in a less restrictive jurisdiction can get the records for them instead. Today there are clear inconsistencies in the application of the Fourth Amendment to cell tracking. While a police officer in Mississippi can claim that she does not need a warrant to obtain cell site records under the Fifth Circuit's decision, her counterpart in the neighboring state of Alabama clearly does under Davis. Instead of waiting for the Supreme Court to resolve this split, right now mobile phone network operators should follow the lead that major communication providers set after Warshak and make Davis the standard nationwide, requiring all law enforcement across the country use a search warrant to obtain cell site location information. We already know from the telcos themselves that they release a great deal of location information to law enforcement without a warrant. 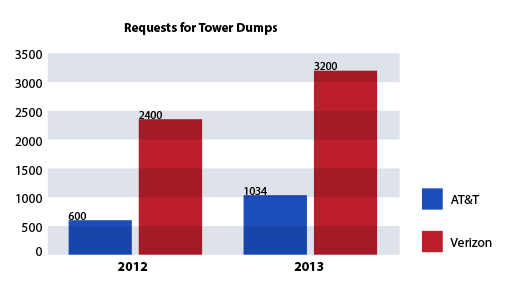 As the number of requests for location information has steadily increased, both AT&T and Verizon have publicly explained they provide cell site information pursuant to an order issued under the Stored Communications Act, which does not require a showing of probable cause. In its first ever transparency report, Verizon noted that 68 percent of the 35,000 demands for cell phone location data in 2013 involved requests through a court order, not a search warrant. After Davis, the telcos' practice of turning over location records in response to a mere "order" must end. Instead, to ensure the Fourth Amendment is applied consistently across the country, the telcos should demand police use a search warrant to obtain any data that can reveal a person's location. In the long run Davis not only calls into question a whole host of other surveillance programs and practices conducted by the government, but gives the phone companies the same ability email service providers had after Warshak to advance the law and even perhaps get the Department of Justice to change its own internal policies. If the companies truly take their customer's privacy seriously, they'll take the opportunity the Eleventh Circuit has given them and tell police everywhere to come back with a warrant.